Please refer to our stock # LE-14 when inquiring. Outer kimono of kasuri (ikat) woven dark indigo-dyed cotton in pattern known as botan-kasuri (peony ikat.) Inner lining is a printed fabric depicting heroic imagery related to Chushingura, the saga of the 47 Ronin; snowy pine trees, helmets, drums, and the retainers themselves. 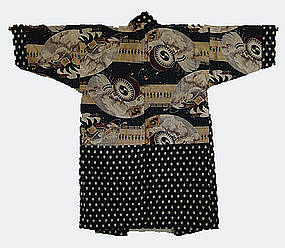 This would have made an excellent kimono to wear on Tango no Sekku (Boy’s Day, which in Japan has recently become the more politically correct “Kodomo no Hi,” or Children’s Day.) Excellent condition, mid-late 1900’s. W.47”(120cm) x L.38.5”(98cm.) Kasuri techniques came to Japan from Indonesia via Okinawa, and became highly developed here. Skeins of thread are bound at certain points before dying, and these undyed areas create the resulting patterns or images. The technique can be used for either the warp or weft yarn, or both. The resulting blurred edges of patterns created by this amazingly complex technique are the characteristic beauty of kasuri.